Let me preface my eulogy with noting my undying admiration and appreciation for nearly all things Google. I blog with Blogspot, I keep track of time with Google Calendars, and only recently started cheating on Google Docs with Dropbox. 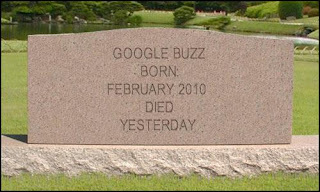 Google Buzz was announced with such promise and hope. Google has had many efforts to be "social," but Buzz seemed like such an opportunity to move forward. Sure there were some hiccups. You'd think that people would not mind sharing all their information given via their email usage to a new kid on the social block. Buzz got past that. Sure, it was tough getting along with Twitter and granted you NEVER got along with Facebook, but you were out here for us Google fans. Gmail was a trusted companion. But in the end, it may have contributed to your demise. People who roamed the social highways and byways just did not get that you were reliant on the email as your social graph, but most folks don't use it like that. I wish more people could have known you. I wish you would known other social services. You were so young, just a baby. But really, you weren't. Google tried to get you out into the cold, cruel world too fast, too soon.